Russian Sport Minister Vitaly Mutko at a training session of the Russian football team ahead of UEFA 2016 Euro qualifier against Montenegro. 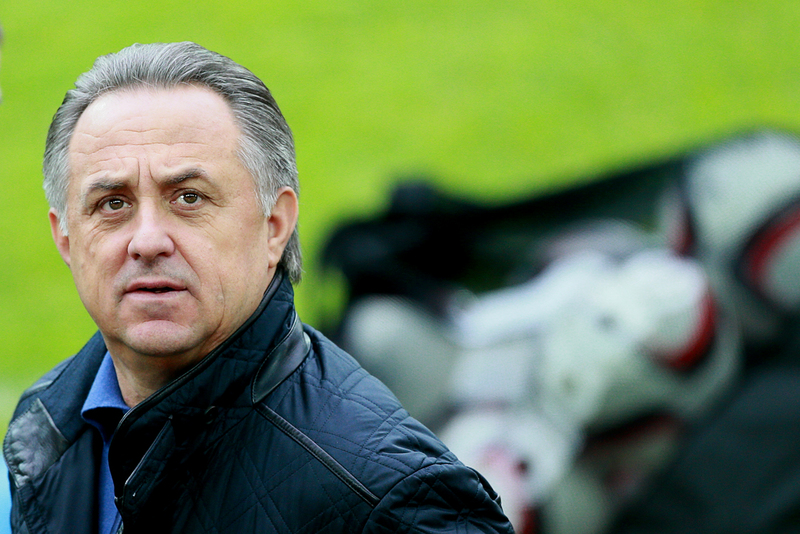 In an exclusive interview with RBTH, the Russian Minister of Sport, Tourism and Youth policy Vitaly Mutko speaks about the recent doping scandal, the 2018 FIFA World Cup and unruly fans. Recently, the image of Russian sport abroad has been damaged by doping, fan problems and other scandals. What are the resources for its recovery? Our key resource is our athletes. It is they who form the idea of Russian sport. We have many outstanding champions that are known to the entire world and a very talented generation is growing up in many sports. The bad attitude towards us is imposed by the Western media. I am sure that not everybody listens to the opinion of the mass media. How would you explain to foreign fans why they should support the Russian team and its athletes at the Olympic Games in Rio despite the doping scandals? We understand that we have problems in this area, but we are trying to combat them by all available means. As President Putin said, we are willing to cooperate in good faith with everyone. We are open. If just one fact of government intervention into sport and doping would be proven, then I would not be here tomorrow. Until 2008, it was impossible to take any samples out of Russia. They were not allowed across the border, there was no proper laboratory. We've invested billions of rubles in Moscow's anti-doping laboratory. We established the Russian Anti-Doping Organization (RUSADA) based on the Norwegian laboratory, which was considered to be the best in the world. But what I'm saying is that our athletes are not to blame in this “great game.” They just want to perform at the Olympics and demonstrate good results. They are ready to pass 20 doping tests instead of two. They are ready to do anything to fulfill their dream. Therefore, they deserve support. The IAAF [International Association of Athletics Federations – RBTH] argues that the ban of the entire Russian track-and-field team – including those that have never been suspected of doping – was due to them being within the system, which creates opportunities for the emergence of such cases. Do you think that such a system has been established? Who is responsible for its creation? Have those that are responsible been punished? I have never denied that our track-and-field athletics program has problems. Long before the first ARD film, I openly discussed the issue in the media. In 2014, we received a document from the IAAF, stating that they conducted an investigation and found that 125 athletes regularly took illegal drugs from 2009 to 2011. Of the 125 athletes, 15 were Russians. We initiated a probe. Our federation's entire leadership was dismissed and 15 athletes were suspended. We've punished our own (athletes and administrators). But where are the cases of 110 other athletes? I follow this case closely and see that neither they nor the leaders of the federations of those countries have been touched. Why? Before that, there were terrible scandals in cycling – Lance Armstrong; skiing – the Finnish national team at the 2001 world championships; weightlifting – the Bulgarian national team at the 2008 Olympics in Beijing; and a case involving top athletes from the United States. Why did nobody create commissions and demand, for example, the removal of the U.S. cycling federation from the Olympic Games? In the U.S. none of the professional leagues, including the NHL and the NBA, are subject to WADA's anti-doping rules. Why does nobody make noise, why is everyone so silent on this issue? Everything is interpreted in a very one-sided manner. Some professionals have the view that everybody is doping, but not everybody gets caught, while the detection of doping depends on what is considered doping and what is not. Is this so? Can Russia influence the decisions about what should be considered doping? Cyclic sports athletes think so. This is the main argument, guiding whether an athlete or skier takes a prohibited drug. This is a tainted way of thinking. This is the mentality that we should fight. If an athlete and his coach think so, then nothing good will come of it. I encountered this when I had just started working as the head of the Ministry of Sports. I came to the Olympics in Vancouver [in 2010 – RBTH] and many of our old-timers, the athletes who were 35 to 37 years old, said that it was impossible to win without doping. They laughed at me and said, who was I to advise them. This had a strong impact on me. I've set about my task of consistently growing a new generation of athletes who will defeat their opponents through training, with the help of modern technologies. No doping. We invest billions of rubles in the development of cutting-edge training bases. I am confident that soon it will bear fruit. In the West, they fear that the problem of violent Russian fans will reemerge at the 2018 World Cup. What work is being done to ensure that the championship proceeds peacefully and without any clashes? We've talked a lot about this subject with FIFA secretary-general Fatma Samoura. First, we will have a very well organized safety system. Russia hosts major international tournaments every year and there have never been any scandals with fans. Second, the Russian Football Union (RFS) will no longer cooperate with the All-Russian Union of Fans (VOB). Instead, we will create a new fan organization. With the new organization, we will reach a common understanding and be able to build human relationships. I am sure that Russian fans will no longer be involved in scandalous stories.